A lot of people want to be debt free; they feel they are drowning in debt and realize they would prefer debt free living. Sadly, even when they make a stab at it they usually fail. You don’t need to be one of them. You can live debt free. You have gotten off to a good start. You have learned what you really need to know for success. You have started on the journey. How can you be sure you will continue to eliminate debt, until you, too, will be debt free? That is the point of this final article in this debt elimination series. When people who attempt to get rid of debt and live debt free fail, their stories usually follow a common pattern. They experience debt stress and start trying to pay off debt. Almost everyone who has a lot of debt has experienced times when under the pressures of too many obligations they decided they had to do something about it. Then followed a few weeks or months of intense and often unpleasant efforts to reduce debts. They get discouraged because the motivation to be debt free lessens as the debt stress shrinks. Under these circumstances progress often seems so slight it is hard to see the light at the end of the tunnel. When their initial efforts release some of the pressures caused by debt, interest falls away and old habits return. Before long they give up on their plan to be debt free and quit. Unfortunately, when enthusiasm has declined enough, the whole plan just falls apart because the pressure is off. That is until the pressure of debt build back up and gets overwhelming again. Then the cycle repeats itself. 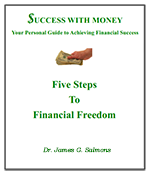 You can succeed where others fail to achieve debt free living when you understand the process and act proactively. Fortunately, you can succeed where others fail to achieve debt free living when you understand the process and act proactively. If you are following the plan described in the previous articles of this series this should not happen to you. Nevertheless, it is important to keep several things in mind and take several proactive steps to assure that you stay on the right path. There are several things you can do to help you keep your goal to be debt free in mind for the long haul. I can’t overstate the importance of having a clear and appropriate vision of your goal in becoming free from debt. Without a clear goal success is unlikely; with it success is almost inevitable. If feel like you are drowning in debt, and your goal is to escape the debt stress of having too many bills, you will have the drive to get started. But you will drop the program when the pressure dies down. If your goal is debt free living, financial success and achieving real financial freedom, you will enjoy the process from the beginning. And as you complete each step of your plan you will gain enthusiasm. Here is a visual that you might want to use. Make up three spending plans. The first is a copy of your current spending plan including all our your debt payments (which you should already have if you are following the advice in my previous articles). Start the second the same but erase all current debts. Remove references to credit cards, loans of any kind, or mortgage payments as if they were all paid off. Since the amount in your spending plan must equal your income, you will now have a great deal of money left over added to your reserve account. For the third, take the amount you removed from paying on those debts and distribute it to other areas as you see fit, perhaps double the current amount for discretionary spending plus fully funding your IRA, etc. Think about how different your life will be living debt free.If you keep your focus on this goal you will have all the motivation you need to go all the way. Now lay these out side by side. Compare the three: one shows where you are, one shows how much money could be free each month to do as you will, and one shows one potential that is much better than what you have now. Think about how different your life will be living debt free. If you keep your focus on this goal you will have all the motivation you need to go all the way. Save these pages to review when motivation weakens. Almost every aspect of financial success is impacted negatively by the short sighted view most people have acquired. It is harder to imagine anything more destructive than the prevalent desire for immediate gratification. Everyone wants everything and they want it now! Very few projects call for patience and persistence more than your debt elimination program, your goal to be debt free. At first progress will seem very slow. The first few months, even the first year or two can be discouraging without focusing on the long view. But as individual debts are paid off and the amount being paid on them are added to payments on others, your payoffs will accelerate. At first you are paying mostly interest, but as you go along you will be knocking off principle payments at an accelerating rate. Work persistently and patiently on your goal to live debt free. Be patient. Keep in mind that there is probably no one thing you can do to improve your life more than to become debt free. It will be much easier to persist if you keep this need in mind from the beginning. When I was a kid and tried to blame one of my decisions on a friend, my mom would say, “I suppose if he told you to go jump in a lake you would do it!” I always groaned. Of course they ignore me and do their own thing anyway. Like all kids. Unfortunately, when it comes to money most adults have lost that independent spirit; instead they follow the advice of bankers, lawyers, and friends who are less well informed than they are or are guided by self-interests that are actually harmful. Even friends will try to dissuade you from your debt free living goal. People hate debt but they do not want to be alone. Ignore them and follow your own insight. Stay self-motivated and focused on becoming debt free. People tend to listen to people they know, instead of listening to people who know. When it comes to money it is really tragic. Most people accept blindly the views of friends and associates. Especially when even a casual glance should tell them that the financial choices of those they are listening to are anything but productive. There are people who know, people whose advice can be trusted, at least to a degree. They are the ones who are successful with their own money. There are people who know, people whose advice can be trusted, at least to a degree. They are the ones who are successful with their own money, especially those who already live debt free. That doesn’t mean they appear to be wealthy. A lot of people who have lots of “things ”are drowning in debt. Often people who appear to be of meager means are managing quite successfully. Whose Support Can You Seek? Unfortunately, one of the biggest problems most people face when they start to take control of their own finances comes from the resulting conflicts with others who don’t understand. Especially family and close friends who hate debt but not enough to live debt free themselves. People experiencing debt stress are threatened by anyone who doesn’t find it necessary to borrow money. Even more by those who happen to have more than a few dollars in savings. It may be guilt, but for whatever reason they seem unable to accept it. The best advice I can give here is to trust yourself. Keep working quietly to become debt free. And keep your mouth shut! Nevertheless, if you can find someone who shares your views or someone who has a proven record of success with money, enlist their support. It can be a real source of encouragement. There are numerous steps people can take to strengthen their commitment to debt reduction and to their financial program in general. First, make sure that you instill into your thinking a solid concept of what you are doing and why. If you have a long history of spending more than you earn and building debt you have to work hard for a while to change your usual thinking about money. One way to do that is to read this series of articles over several times. You might want to read each of them once a week for a month, then once a month for about six months. It takes regular reinforcement for a period to permanently change your thinking on anything new. You may want to read some other resources about debt reduction and elimination. There are several good books and articles that can help. Anything you can do to reinforce your new thinking is helpful. A second thing you can do, and really should do, is to check your environment for negative influences. Keep in mind that most people are anything but successful in the way they handle their money. You no longer choose to be one of them. If your friends or family members are not dealing effectively with their money, do not even discuss money with them. If your friends or family members are not dealing effectively with their money, do not even discuss money with them. As suggested before, if you want to talk with others, look for someone who will be supportive, someone who practices debt free living or who is working at it. People don’t need to be “rich” to be successful but look for someone who spends less than they earn and have growing savings. That is the mark of someone who is in control of their money instead of being its slave. Watch your personal habits, too. Shopping is not a hobby. If you have a habit of “window shopping” trade it in for photography, bird watching, gardening, or anything else you can enjoy without spending much money. The third step you can take is a long term one—to stabilize your new lifestyle with positive reinforcements. Starting is half done, they say, but only half. You have to maintain your course. Every month when you do your financial review and planning session, include specific steps to help keep you on target. When you review your overall financial picture pay special attention to your debt reduction figures. Think about the new things you will be able to do once you are debt free. Assure yourself that you are on course and plan for any adjustments that need to be made. Remind yourself of the positive benefits you are gaining by eliminating debt. Your debt stress level should be declining every month and some of the peace of debt free living begins to be realized as soon as progress starts to be clear. When you reach specific milestones you may want to celebrate somehow. Just don’t spend any money doing so unless you can pay for it. With cash. If you start with the amount of debt most people do you can rarely get rid of all debt over night, but it is within the capacity of anyone who sets out to live debt free to achieve that goal. If you apply what you learn here it is only a matter of time until you will be debt free and enjoying all the benefits of debt free living.